It has become a yearly event, this trip to the Harz Mountains. This year we will be based in Quedlinburg, the old town of which is a UNESCO World Heritage Site. We will ride a special train with vintage loco and rolling stock, making stops at photographic vantage points which are carefully selected. We start our tour by taking a lunchtime Eurostar from London St. Pancras International to Brussels where we connect to high speed train to Cologne. The hotel Ibis Am Dom is found in the station building under the shadow of the medieval Cathedral. We take a mid-morning train travelling via Hannover to Quedlinburg for an afternoon arrival. Transfer to the Flair Hotel Schlossmühle, our hotel for the next 5 nights. A free day to explore the Old Town. This medieval town boasts over 1,200 half-timbered houses and was recognised in 1994 as a UNESCO World Heritage Site. Alternatively, Wernigerode the most colourful medieval city in the Harz, is around 45 minutes by mainline train. 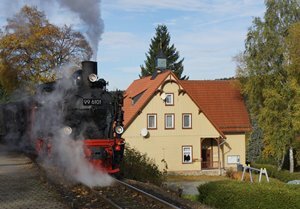 We depart from Quedlinburg behind engine '99 5902' travelling the length of the Selketalbahn to Eisfelder Talmühle. From here we head towards Drei Annen Hohne and up the Brocken, reaching 1,141 metres, the highest peak in the Harz Mountains, offering spectacular views of the tree-lined hillsides before returning to Wernigerode. A coach is booked to return us to Quedlinburg. Today we join our heritage train from Quedlinburg to explore the Selketalbahn. The traction today is booked to be '99 6101', '99 6102' and '99 5906', today's trains are due to be a mix of passenger and freight rolling stock. There will be plenty of opportunity for photographic run pasts. This morning we take a steam hauled service from Quedlinburg to Nordhausen. On arrival we take a city tour of Nordhausen in a historic tram before returning to Quedlinburg in one of the HSB's historic railcars. On the return we make a short diversion to Hasselfelde so that we can say we have covered the entire 140km of narrow gauge railway. We take the 0933 train back to Magdeburg and then Hannover, continuing by high speed line to Wuppertal, arriving early afternoon. After checking in to our hotel, the InterCityHotel Wuppertal, the afternoon is free to explore. A local transport card is included for the Rhine-Ruhr area which, of course, includes free travel on Wuppertal's famous suspension railway. A morning departure by regional train to Cologne where we transfer via the high speed line to Brussels and finally London. Arrive back in London mid afternoon. The tour is priced from £945 per person and if you wish to discuss the content in detail further please don't hesitate to contact us direct on 01766 772030 or email info@ffestiniogtravel.co.uk. The itinerary of the tour can be found on our website at www.ffestiniogtravel.com.